There is a chance to win a free strikeez for every $30 spent on products like deli foods, fresh fruits, bakery, frozen food, and more. 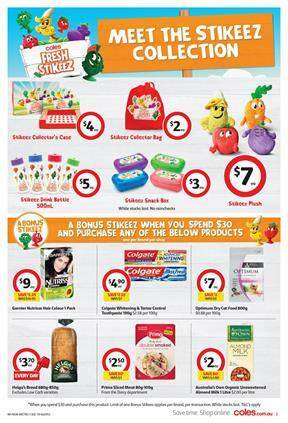 Coles promotes the deal and products on the first part of the catalogue. Browse the entire Coles Catalogue for Valentine's Day gifts. You will have only one day to shop these gifts since the catalogue deals are effective starting on 13 Feb. Ferrero Rocher heart, Hallmark Valentine's Day card, Lindt Lindor chocolate gift box, and more are available on pg 14-15. One of the best deals is the half-price deal on belVita breakfast biscuits, Kinder and Cadbury chocolate bars, Real Foods corn thins, Cheetos and Twisties. We can buy Nutri-Grain, Smith's chips, Twinings tea pack, and Sirena Tuna at half prices this week. The deal has been advertised on the first page of the catalogue. Steggles family roast whole chicken is priced at $2.90! Coles became a good place to spend some time with your family. A lot of fun products, gifts, toys, special discounts and similar elements of joy are being featured in stores. A page of Coles Catalogue has only the half prices on Kellogg's coco pops, FatBlaster, Hershey's, King Oscar, Dole Pineapple, Robert Timms, and La Espanola olive oil, Pureharvest Coco Quench coconut milk and more products. King of Hearts bouquet and more Valentine's Day gifts are available on pg 14-15. View pg 10-11 for dairy products and seafood discounts. You have banana prawn meat, Tassal smoked salmon, John West salmon with lemon at lowered prices. Yoghurt variety including flavored ones and packs of yoghurts are on sale, too. Check out pg 10-11 for all these new deals.